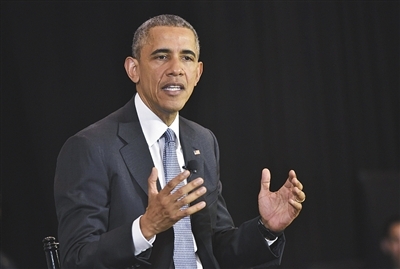 Ousting Libyan dictator Moammar Gadhafi without a strategy for what followed was his worst mistake, says President Barack Obama. In 2011, NATO-led forces ousted the Libyan dictator. After that, Libya fell into chaos and turmoil. Obama said his administration failed "to plan for the day after" Gadhafi was ousted. However, he said, taking action in Libya to protect civilians from Gadhafi's forces was "the right thing to do." Gadhafi was captured and killed months after the United States and European nations began air attacks. The country was left in chaos. Militias took control, and two competing parliaments and governments were formed. Libya became a place migrants used to get to Europe. This helped worsen Europe's immigration crisis. A unity government supported by the United Nations is in the capital Tripoli. But neither of the country's two competing parliaments has announced support for a peace agreement. Obama said Libya is now a "mess." On Monday, Obama's spokesman Josh Earnest noted that in a speech in September 2015 to the U.N. General Assembly, Obama said "our coalition could have and should have done more to fill a vacuum left behind." Earnest said the president believes the United States and other nations have not given Libya the help it needs to become stable. The president asks "about what situation will prevail and what sort of commitments from the international community will be required after" military action has been ordered by the president, Earnest told reporters. Obama said his greatest accomplishment during his more than seven years in office was saving the economy from collapsing. The 2008 and 2009 economic recession was the worst in the United States since the 1930s. Millions of people lost their jobs and were unable to pay their home loans. Since then, the economy has improved, and the jobless rate is much lower. Obama said the best day of his presidency was in 2010, when Congress approved national health care reforms that came to be called Obamacare. The program has given health insurance to millions of people who did not have it. Obama said the worst day of his presidency was in late 2012, when he visited the small town of Newtown, Connecticut, two days after a gunman killed 20 students and six teachers at an elementary school. At length I fell into some broils. The mayor surveyed the situation before taking action. Water and electricity supplies in the city have been cut off because of the American air attacks. The Federal Government has created the problem, with its failure to solve the nation's illegal immigration crisis. 1.Libya became a place migrants used to get to Europe. If you got to get to us, go back to the fork. Can you tell me how to get to the railroad station? 2.But neither of the country's two competing parliaments has announced support for a peace agreement. Neither of us is sensitive about age. Now was neither of them adept at using maps.